The Canadian Rockies comprise the Canadian segment of the North American Rocky Mountains range. Four national parks within the Canadian Rockies interlock and make up the Canadian Rocky Mountain Parks UNESCO World Heritage site: Banff, Jasper, Kootenay and Yoho National Parks. All four National Parks have immeasurable beauty (the Canadian Rockies have over 1,000 glaciers), crystal clear lakes, pampering resorts and lodges, and enough outdoor activity to indulge your adventurous side. Located in Banff, Lake Louise is home is one of the largest ski areas in North America and is known for its pristine powder conditions. 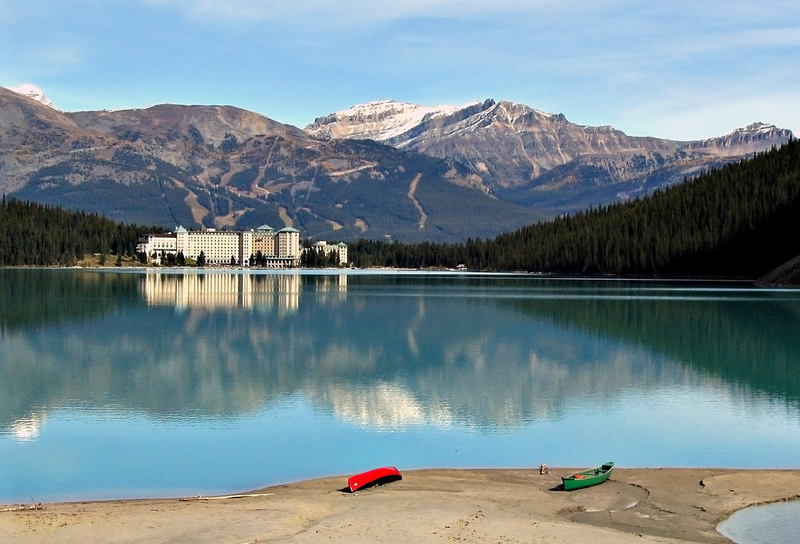 But in the summer months, Lake Louise is more quiet and laid back, offering luxury accommodations. Lake Louise itself lies in a valley close to some of the higher peaks in the Canadian Rockies. This makes it a popular spot with rock climbers while the turquoise lake is popular for canoeing. Jasper National Park is the largest wilderness park in the Canadian Rockies. Head into the backcountry where elk, moose, and grizzlies are more abundant than people. For a rugged experience, stay in one of Jasper’s backcountry camps. For a little more comfort, Jasper offers a network of backcountry lodges. Jasper is also home to Maligne Lake, the largest glacially formed lake in the Canadian Rockies (14 miles in length). Boat tours allow you to immerse yourself in its natural beauty – including a stop at tiny Spirit Island, one of the most photographed locations in the world. Kootenay offers hanging glaciers, the limestone Marble Canyon, and natural mineral pools at Radium Hot Springs. Kootenay was once a meeting place of Plains and Mountains First Nations peoples as well as fur traders. Today, the Radium Hot Springs, surrounded by natural rock walls, are one of the star attractions of Kootenay. 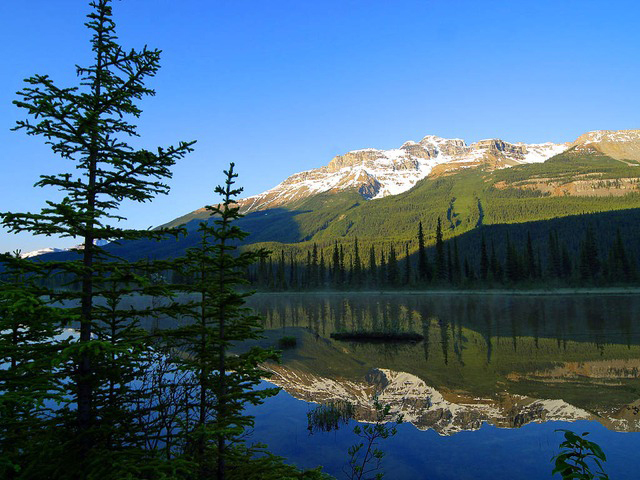 The word “Yoho” comes from the Cree word for “awe” and “wonder.” Bordered by Kootenay on the south and Banff on the east, Yoho lives up to its Cree name. Natural beauty abounds with plenty of outdoor activities. If you are there between July and October, canoe on the crystal clear Emerald Lake. The lake typically remains frozen the rest of the year. Yoho also has some of the best whitewater rafting in the Canadian Rockies. Kicking Horse River has class II to IV rapids, making it a great experience for beginners as well as more experienced rafters. A great family outing! No matter where you travel in Canada, we can help you stay connected. 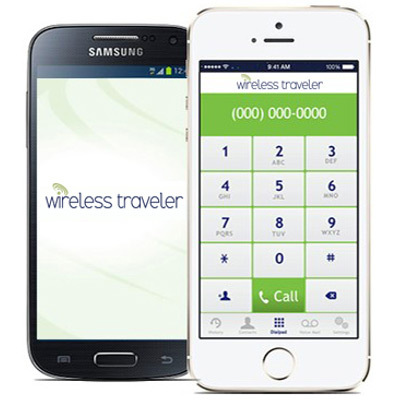 Download our low cost WiFi Calling App, from iTunes or Google Play, and your calls to the United States will be 2 cents per minute. If your friends and family also download the app, you can enjoy free app to app calling! For data connections, we recommend a Pocket WiFi Hotspot with unlimited data. You can rent one for as low as $79/week (special discounts for extended stays) and it will accommodate up to five devices. We also offer a Global WiFi program with low cost bundles if you need higher speeds (e.g., for streaming applications like music or video).